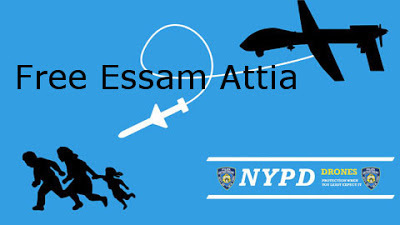 Essam Attia is the artist who mocked the NYPD and its use of drones. He placed images, in public areas, which criticized the NYPD's use of drones. The NYPD was able to track him down and have charged him with 56 criminal counts as a way to make an example of anyone who dare make a mockery of the NYPD's oppression. Thou shall worship oppression and praise its glory.